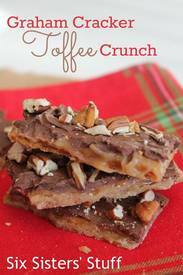 You Will Go Crazy Over This Easy Graham Cracker Toffee. It tastes just like regular toffee. In fact, I think we like it even better! No need for a candy thermometer! This can easily be bagged and make the perfect neighbor gift! I of course, temper all my chocolate, especially if I was going to give it away as a gift!